RIVERSIDE, Calif. (AP) — A California couple tortured a dozen of their children for years, starving them to the point that their growth was stunted, chaining them to their beds for months at a time and forbidding them from showering more than once a year or using the toilet, a prosecutor said Thursday. Hestrin did not say what finally triggered the girl to act. The victims range in age from 2 to 29. The torture and false imprisonment charges do not include the 2-year-old, who was not malnourished. All the children’s names begin with the letter J, according to court documents that didn’t provide their full names. The parents were jailed on $12 million bail each after pleading not guilty Thursday at their first court appearance. If convicted, they could be sentenced to life in prison. 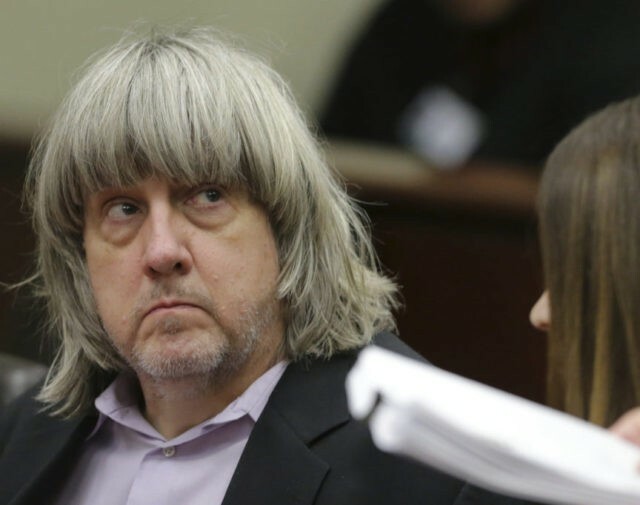 David Turpin’s lawyer, deputy public defender David Macher, had only begun to investigate the allegations, but said the case was going to be a challenge. Judge Michael B. Donner rejected Macher’s request to ban cameras from the courtroom, saying he didn’t see how news coverage of a case already so highly publicized could harm the Turpins. “I am told that coverage of this case literally spans the globe,” the judge said. David Turpin’s father, James, the grandfather to the children, said from his home in Princeton, West Virginia, that he did not believe the reports about the abuse. The charges date to 2010, when the couple moved to Riverside County from outside Fort Worth, Texas. At one point while the couple lived in Texas, the parents lived in a separate house from most of the children and dropped off food to the others from time to time, Hestrin said. When not restrained, the children were locked in different rooms and fed little on a schedule. Punishments included being beaten and choked, Hestrin said. On Sunday, three children had been shackled to beds, though the parents freed two of them — ages 11 and 14 — when officers knocked on the door, Hestrin said. Deputies found a 22-year-old chained to a bed. The children never received dental care, and they had not seen a doctor in more than four years. When the girl who escaped was asked if any pills were in the home, she did not understand what medication was. The children, who were schooled at home, were rarely seen outside the house, though the parents posted photos of them smiling together at Disneyland and in Las Vegas, where the couple renewed their wedding vows. While the children were deprived of food, the parents ate well and even taunted the children by putting apple and pumpkin pies on the kitchen counter, but not letting them have any, Hestrin said. Melley reported from Los Angeles. Associated Press writers Michael Virtanen in Pittsburgh and Michael Balsamo, John Antczak and Christopher Weber in Los Angeles contributed to this report.